Snowflakes and snow in general are a particular fascination of mine and I've wanted to use that theme in these materials for a number of years. 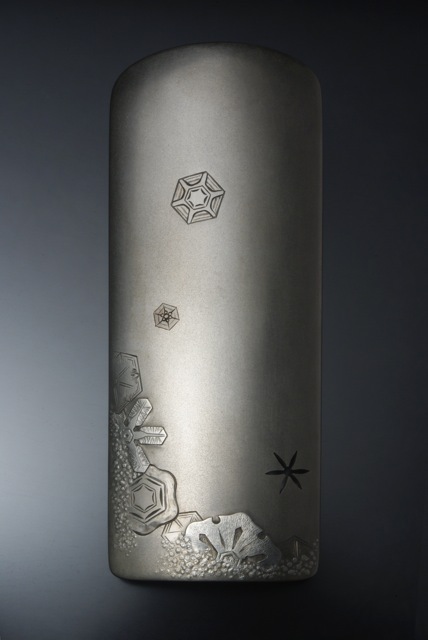 The main piece is 50/50 (copper/silver) shibuichi from Phil Baldwin. Two snowflake inlays in fine (pure) silver and one small inlay of 70/30 (copper/silver) shibuichi. Also a bunch of inlayed and chased fine-silver wire bits using five sizes of wire from 22g to 30g. This piece has been one of my most demanding both in design and technique. It's the most abstract work I've done. I decided to make the snowflakes mostly of the "plate" type as I thought that more solid form would contribute to the layering effect I wanted. Also the more feathery type of flake would be beyond my capability to render at this scale! The hexagons also had to be very convincingly symmetrical. Although I took design hints from a silver vase by Nakagawa Joeki in the catalogue Flowers Of The Chisel from Malcolm Fairley Gallery, I had to make many decisions about materials, placement, depth etc. relating to this form. The Shadow-Master (wife Jean) was indispensable as usual, especially in the placement and size of elements. As always, an outstanding piece. Top notch design and workmanship. Thanks very much Ken. Much appreciated! This is so lovely. In the middle of the summer the thought of the bountiful snow of the past winter, and the beautiful personalities of each different snow fall is quite a nice pairing of your carved flakes and the memories. The work appears to be flawless, which for me is calming. Thank you for these images. Thanks for sharing. Your work is beautiful and very nice to see, I enjoy seeing what you create. Thank you for these images. Snow flakes do not come this far south very often, it was nice to see them. Thanks very much Ed and Janel!